Why Should Anyone Be Afraid Of Dying? By Karl A. Pillemer, Ph.D.
We seem to be inundated now with books about death -- and about how great it is. I assume that this is part of the aging of the baby boomers (I remember someone quipping that we'd know the end of the baby boom had come when we started to see designer funeral parlors). Now we have doctors and neuroscientists and four-year olds claiming to have visited heaven. And -- surprise! -- it's just like you think it would be, with butterflies, and angels, and hymns being sung. I do get a bit suspicious when visions of heaven are exactly what we humans expect (my favorite quote from monk and spiritual writer Thomas Merton: "One thing's sure about heaven -- there won't be much of you there"). Suddenly it hit me: Why are we going to these young people for advice about how to handle our own mortality? If I were interested in how kids feel about going to college, I would interview high school seniors. If I wanted to know about planning for parenthood, I'd ask young couples thinking about having a child. So if we want to know how to prepare for inevitable death, why not ask the people who are almost there? Bingo -- old people. In our project that collected life wisdom from over 1200 of the oldest Americans, one thing I knew I wanted to ask them about was death. Yes, I confess that the whole death thing is pretty troubling to me -- that one event you just can't get out of. Of course I'm not alone: there's now a whole school of psychological research based on the concept of "terror management." This theory (not one of the more cheerful ones in social science) posits that the awareness of our own inevitable death creates the potential for debilitating terror, against which we then find ways to psychologically defend ourselves. If anyone should experience this kind of terror, it's the very old. They are, after all, statistically much closer to the end of life than those of us under 60. No matter how healthy or active they may be today, they are genuinely at death's door (or at least on the front steps). So I decided to bite the bullet, look 80, 90, and 100-year olds in the eye, and ask them: "When people reach your age, they begin to realize that there are more years behind them than in front of them. What are your feelings about the end of life?" We discussed what they thought about dying and whether it concerned them and occupied their daily thoughts. One question repeatedly entered my mind while listening to the interviews: Where's the terror? Because what the elders told me is that the intense, overpowering fear of dying is very much a young person's game. I did not detect denial from these elders but rather a matter-of-fact approach to dying and a willingness to discuss it and what it means. The vast majority of our respondents described themselves as not thinking about death much, and much less so than when they were younger. It's true, by the way, that research shows lower death anxiety with advancing age. Nevertheless, I wasn't prepared for the comfort level most of the elders expressed about their own deaths. Here's how some them talked about their own mortality. Edwina Elbert embodied what I learned is a common attitude of the elders toward the end of life: a mix of interest, curiosity, and acceptance. Edwina is a warm, witty, and very open ninety-four-year-old. Her brushes with a serious accident and an illness have led her to reflect on the end of life and what it means. It has made me realize that there's always that question of why nobody knows where we go. Well, there must be a reason for that. We'll never know because that's a mystery. I know about as much about it as the most learned men in the world, I would imagine. Because nobody really knows what happens to you. But I am very comfortable. I'm not afraid to die. Being near to death impacted me greatly, to be honest, and I don't talk about it. It's something that's very personal. But I'm a better person for it. I do wonder -- I think God must be saving me for something and I can't figure out what it is. Maybe I'll know someday when I'm 110. But about dying, I'm not one bit afraid. Well, if you stop to think about it, it's a natural thing. Everything dies. Whether we come back or not or what happens there, I don't know. But it's like my husband used to say whenever we did discuss it: "If you go to heaven, how wonderful. But if you go to sleep, what's wrong with that?" As you might expect, deeply religious elders found their beliefs to be comforting as they contemplated the end of life. Rosemary Brewster, ninety, is a regular churchgoer and has been all her life. When asked, "Do you believe in life after death?" she replied: "I often wonder about that. I think and I wonder if there really is. And I'm going to find out. I wouldn't bother worrying about it too much, because I'm going to find out." Rosemary pointed out that her feelings had changed greatly in later life. But, you know, when you're younger you go to bed and you think about death, and "Oh my God!" Or you're sick: "What if I don't wake up?" I don't think that anymore. Now that I'm old, I'm at peace when I go to bed. I figure if I don't wake up, well, maybe I'll be someplace nicer. It's just a funny thing. I used to be scared to go sleep when I wasn't feeling good, but not anymore. I'm not ready to die or anything like that, but I'm just not afraid to die. I think there's something on the other side, and I've got some sisters over there who will be waiting for me. I'm not worried at all. And that's something I didn't think I'd ever come to terms with. I would like to dispel the notion, however, that it's just religious people who shed an intense fear of dying as they grow older. I found the same kind of matter-of-fact comfortableness with life's end among elders who were vehement nonbelievers. Take Trudy Schaffer, for example, whom I interviewed in her art-filled and book-lined apartment in New York City. If there ever was an urbane New York intellectual, it is Trudy. A highly self-aware, analytical individual with a vast range of life experience, Trudy is adamantly not religious. She told me: "I believe nature is God. My mother and her mother came from a religious family. But my father did not believe in religion and so we did not grow up with religion." Like Rosemary Brewster, however, Trudy told me about the change in her fear of death as she aged. She explained that the panic over death is "a younger person's game." I mean, life is death and death is life. If I die, I die. Dying is what I was thinking about when I was younger. I remember thinking, "How can I die? How can I not be alive?" That panicky feeling. But now I haven't thought about it in years. I know it can't be much longer--I'm eighty-seven. But I just don't worry about it. That's why I want to go out every night, as long as I can afford it. I want to do everything I can do. But I'm not worried about dying -- don't even think about it, really. Although they seem unconcerned about the fact of dying, the elders do have one end-of-life recommendation for people of all ages: plan for it. Indeed, when asked about their views of death and dying, the worry they mentioned most frequently was not being organized and leaving a load of work behind for their families. I learned that planning "for the journey," as some experts referred to it, was seen as responsible behavior as well as providing a significant source of comfort. One particularly delightful interview I conducted was with Ted and Lucy Rowan. I interviewed this couple, married for fifty-seven years (as Ted put it, "to the girl of my dreams") in their cozy apartment in a retirement community. It's an interview that I left smiling, after being treated to their warmth and companionability. They raised four successful children and are active in the community where they live. Both are in their mid-80s. Well, I think about death easily because our proxy and our will are all set. But our concern right now is more about the stuff we have. Do you see all of these things we've accumulated? Look at the albums I have, and I'm sure my children are not going to want them. What am I going to do with them? And Ted has boxes of lectures stored in a garage. I am really an organizing person, I really enjoy that. These sentiments were echoed by many of the elders. The experience of "tidying up" one's possessions emerged as a metaphor for tidying up the loose ends of life, bringing things together in a meaningful whole rather than a disorganized set of unrelated parts. My frank and open conversations with the oldest Americans about the end of life did not reveal an underlying terror but more of a curiosity, acceptance, and a desire to "prepare for the journey" ahead. In fact (as I describe in my book based on this project), the awareness of death and the short time horizon remaining produced a desire to savor life in the moment and to take every advantage of the time that is left. So perhaps more than listening to young people's trips to heaven, we can benefit from talking to people who are close to making the real and final trip to -- well, whatever's next. I have to admit, it helped me. If they're not so worried, why should we be? 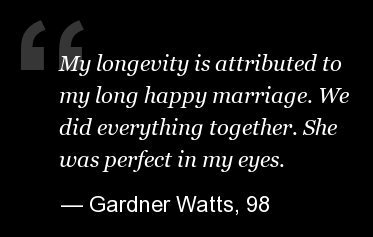 Professor of Human Development, Cornell University; Author, "30 Lessons for Loving: Advice from the Wisest Americans on Love, Relationships, and Marriage"